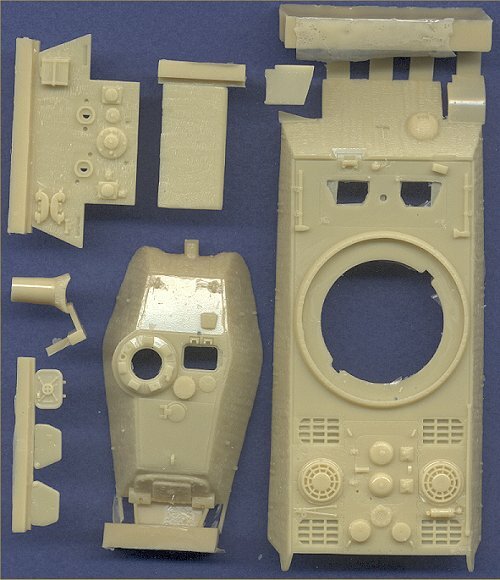 Designed for the Revell Porsche King Tiger kit, this set converts is into one of the later vehicles with zimmerit applied. Since the kit did not include zimmerit, it could only represent one of the three prototype Tigers, unless the modeler added zimmerit on his own. As with Coelians other "zimmerited" vehicles, this one is incredibly well done. Coelian models some of the best zimmerit I have seen. This set also corrects the only flaw in the Revell kit, that being the armored ring around the base of the turret. The Revell kit lacked this feature, and it is replicated here. Additionally, although it wasn't a flaw, per se, the closed crew hatches on the Revell kit were a deficiency in my eyes, and again, Coelian comes through for us by opening the hatches, and provided separate hatches detailed on the inside and out. Another outstanding release from Coelian Models.